Call in to taste our wines in a picturesque vineyard setting at 32 Penna Lane, Penwortham, South Australia. The Cellar Door is open on Fridays, Saturdays and Sundays, from 11am to 5pm. We are also generally open on public holiday Mondays, from 11am to 2pm. We will be open on Easter Saturday, Sunday and Monday, from 11am to 5pm. We will be closed on Good Friday. All our wines can be purchased at Cellar Door, including some you won’t find on the website, and they can be shipped anywhere within Australia. Follow the signs from Penwortham on the Main North Road to head deep into the beautiful Skilly Valley, along Horrocks Road, across Hughes Park Road and then down the actual Penna Lane. 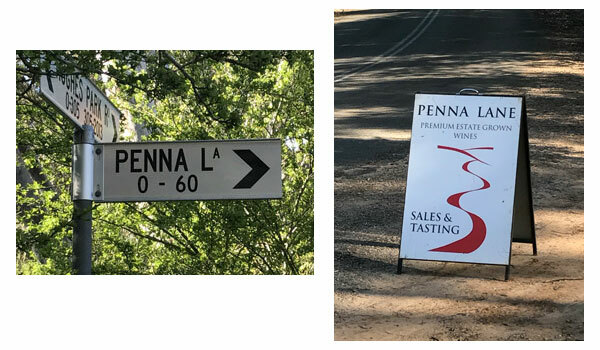 The entrance to Penna Lane Wines is on the right, just past Kilikanoon Wines.